Paytm announced that its QR code based payment solution is now powering over 35 lakh merchants to accept digital payments. The solution is actively used by consumers to pay at a wide range of merchants that include large organized retailers, hospitals, tolls, food courts to neighborhood shops. 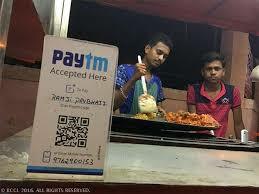 Paytm was the first company to invest in QR Code-based payments and its unique scan-to-pay user flow is fast becoming ubiquitous with mobile payments across the country. This zero cost payment solution combined with Paytm’s large customer base and breadth of use cases has enabled the company to build the largest and fastest-growing payment network in the country. Paytm has undertaken several initiatives to help the country’s merchants start accepting digital payments for free. It has made its platform available in 10 different regional languages – Hindi, Tamil, Telugu, Gujarati, Marathi, Bengali, Kannada, Malayalam, Oriya and Punjabi thereby resulting in a 5x traffic increase for the platform from smaller towns. It has also launched a 24*7 Merchant Helpline to assist merchants across India accepting payments using its cashless payment solution. Paytm powering over 35 lakh small merchants 0 out of 5 based on 0 ratings. 0 user reviews.